Since you’re reading this post you’re obviously interested in knowing more about triathlons. A not too wild guess would be that you might be interested in doing one. AWESOME! You’re about to discover why so many people are getting sucked into this amazing sport. Nah, lifestyle. This post is the first in a series of posts geared towards beginner triathletes, and here we'll get down to the nuts and bolts of what a triathlon really is and how it works. I hope by the end of it you’ll have gained more knowledge AND become inspired to take the leap and give it a tri! There’s also a great freebie download for you that goes along with this post – a Five step roadmap to completing your first Triathlo﻿n. This roadmap takes the process of going from scratch to completing your first triathlon and breaks it down into easy-to-follow steps. Perfect for beginner triathletes just starting out, so click the link to get yours now! A triathlon is an endurance sports event consisting of a swim, a bike and a run. These disciplines are performed right after each other with only short transitions in between. There are many different variations on this. The most common triathlon race distances are the sprint, Olympic, half Ironman (or 70.3, for its total length in miles) and the Ironman. 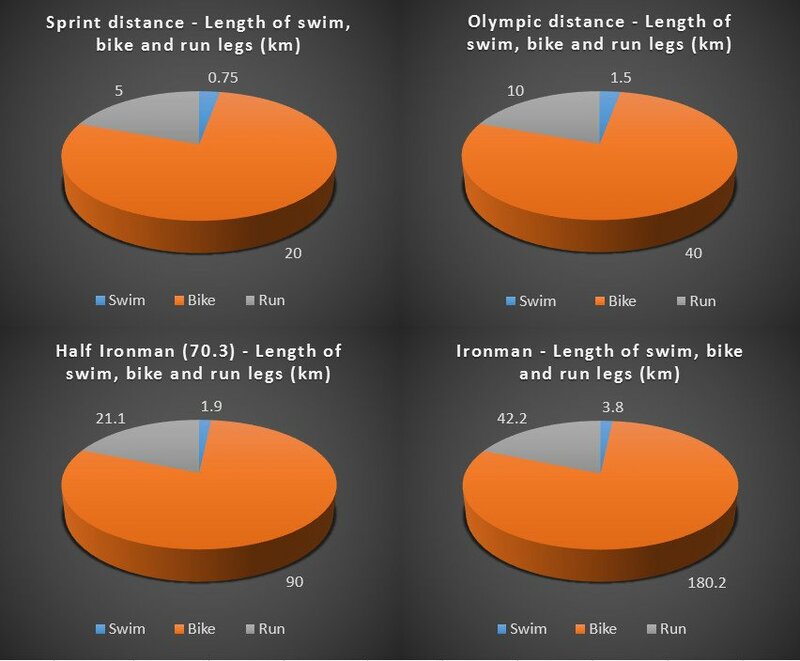 The table below shows the breakdown of each race distance in terms of the swim, bike and run. Also, to give you a (very) rough idea about what the duration of these events might be for average Joe age-group triathletes, I put some reference finish times in there as well. Obviously, there’s a huge variation in these times based on individual fitness level, experience and bike color (just kidding), so take it with a grain (or bathtub) of salt. I really want to emphasize that these are not typical times for first-timers, they just give you an idea of the time-scale on a very basic level. For those of you using the imperial system and not the metric one, sorry for the inconvenience in deciphering distances. The thing is, with the exception of the Ironman, the distances of the swim, bike and run legs are most often expressed in the metric system since the numbers are so much rounder and nicer. 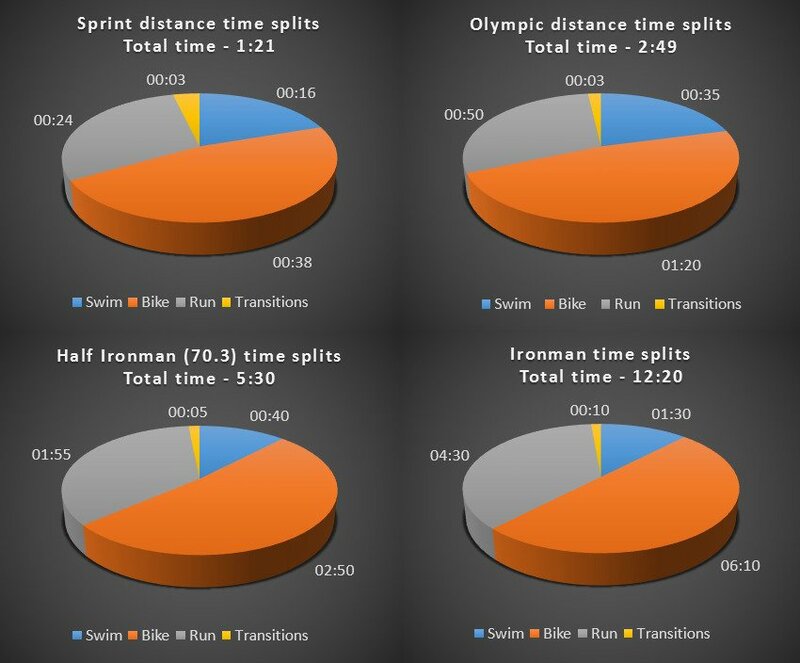 Digging a bit deeper still in the distances and “typical” times, the charts below puts the distances of each leg for the different triathlon events in a more visual format, and the average Joe finish times are broken down into typical times for each leg, including transitions. Distances of each leg of the four main triathlon events - sprint, Olympic, Half Ironman (70.3) and Ironman. Example times and time splits of a typical age-grouper. Note that these are just examples. There is a large variance from individual to individual. “That’s all well and good, but how do you actually do a triathlon in practice?” I hear you say. It’s pretty simple really. I’ll cover everything that happens on race day in more detail later in this series. This is the bare-bones version of the sequential order of events that comprise a triathlon. 1. Go to your spot in the transition area. This is a small zone about one times two meters, and includes a bike rack. Set up your bike, helmet, running shoes, possible changes of clothes etc. in this zone. What a transition area might look like. 2. Get ready for the swim by putting on your swim-suit or wetsuit. Go to the start. The start can be a deep-water floating start (start from treading water), a beach start (enter the water running from the beach) or a dive start (jumping into the water from a pontoon). 3. When the gun goes off, you begin swimming the course which is marked with big, colored buoys. Depending on where you are in the swim pack, there might be a lot of bumping into each other going on. This can be a bit challenging for beginners who are not used to this fight for space, but further back in the pack or towards the outside of the course this will generally not be as big a problem. 4. At the end of the swim you get out of the water (onto the beach or a pontoon) and run a short bit (the distance varies, but a couple of hundred meters is common) to your spot in the transition area. 5. There you do a quick change of clothes. If you swim in a swim-suit you generally just put on shorts and t-shirt on top of it, put on your helmet and grab your bike from the rack. You run with the bike to the end of the transition area, where you can mount the bike and head out on the bike course. 6. On the bike course the main thing to keep in mind is whether the event is draft-legal or non-drafting. If it is draft-legal, you don’t need to worry about anything else than following good bike etiquette and general traffic rules. If however, it’s a non-drafting event, you have to stay at least a specified distance (ten meters is common) behind the triathletes ahead of you unless you are overtaking them. This is to make sure that people don’t take advantage of the decreased air resistance when staying close to the cyclist ahead of them. 7. At the end of the bike leg, you dismount before entering the transition area and run with your bike to your spot and hang the bike on the rack. If you use bike shoes, you change into running shoes and exit the transition area on foot for the final leg of the race. 8. The run is a straightforward affair, although by no means an easy one. As you can guess, it can be very exhausting one after swimming and biking. Just hang in there and follow the course markings (and other participants) and you’ll get to the finish line soon enough! 9. After completing the race, enjoy the post-race highs, hanging out with other participants and snacking from the goodie bag that is often provided by the race organizer. Triathlon is a fairly straightforward sport when it comes to rules. Some rules are general, while others depend on location and the specific event. We’ll discuss the most important general rules here. These are the ones that are the most important to know for beginner triathletes. You should always make sure you check the rules as provided by the event organizer though, and don’t rely on just knowing the general rules. Also note that a large fraction of the rules concern the gear you’re allowed and not allowed to use. I won’t go into detail about those rules here, so check with the event organizer if you’re not sure whether your gear is allowed or not. For the swim, you should know that wetsuits are prohibited when the water temperature is above a certain level. In the US, this temperature is 78.1 °F (25.6 °C), but this varies from country to country. It is also good to know that although professional and competitive triathletes will always swim freestyle, there is no rule stating that you have to do this. Many beginners and age-groupers complete the swim leg using breast stroke for example. You have to mount the bike after the mount line when exiting the transition area at the start of the bike. ​You have to dismount the bike before the dismount line when entering the transition area at the end of the bike. ​You have to wear a helmet at all times that you are riding the bike. That means, put it on before mounting and remove it only after dismounting first. 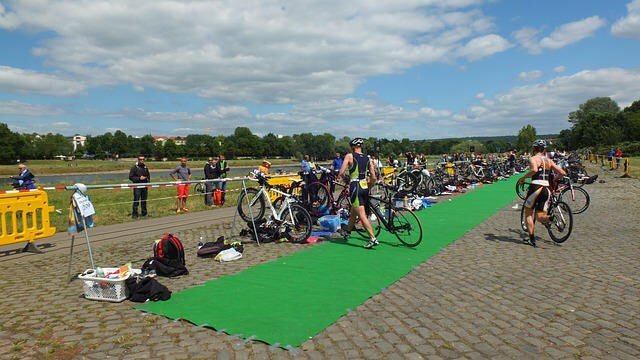 ​If the race is a non-draft event, you can only enter another bike’s draft zone (10 meters from the front wheel extending backwards) for a short time (20 seconds) when passing that bike. Finally, littering and unsportsmanlike conduct is prohibited, although of course you would never do that! And that’s it, the rules of triathlon in a nutshell! Hang on - isn’t this just for pros and ripped super-humans? Heck no! Triathletes come in all shapes and forms, from all walks of life. From happy weekend-warriors who don’t mind carrying around a bit of extra weight while participating in triathlons, to serious 60+ age-groupers aiming for the World Championships. You don’t need to be fast to enjoy participating in triathlons. And you don’t need to have any athletic background to quickly become good enough to complete all three legs of a triathlon. If you don’t believe me, check out these case studies. Kristine Jahn changed her lifestyle and diet and lost 225 lbs. When she first started running she made it 100 yards. She is now an Ironman. Susan Lacke finished Ironman Wisconsin just 20 months after deciding to run her first 5k! As a final example, Arthur Gilbert, UK, who sadly passed away in October 2015 aged 94, became the world’s oldest triathlete in 2012, when he finished a sprint triathlon in two hours 47 minutes. He started doing triathlons as a relative youngster, at the age of 68. And you know what, although these are exceptional stories and exceptional people, there’s a whole lot more of them out there. The take-away message here is, whatever your current level of fitness is, by taking small, consistent steps towards your goal, there’s nothing stopping you from becoming a triathlete. Why you DEFINITELY want to do a triathlon! ​You’ll get massive health benefits – live longer, minimize risk of diabetes, high blood pressure, cardiovascular disease and what not. You’ll experience weight-loss and fat-loss by burning more calories than ever before! You’ll have a whole lot of FUN – the variety in triathlon training takes care of that. You’ll enjoy socializing with fellow triathletes (they’re a nice bunch!) from all walks of life in both training and racing. You’ll get more energetic and productive in the rest of your life. You’ll become a role model for kids, family and friends. You’ll enjoy pushing your boundaries – in just a few weeks of training you can do things you never would have thought possible before. And there’s plenty more where those came from. I could go into a lot of detail on all these benefits, but seeing as this is already becoming a pretty long post (Again! When will I learn?) I'll just give a couple of short examples. Just know that they’re all real, relevant reasons, and many of them can work as wake-up calls and dispel some of the excuses people make for not taking the leap. For example, lack of time is a big obstacle for most people. But, if you’re like most people, you’ll soon find that if you do a workout first thing in the morning, you’ll be a whole lot more effective and productive the rest of the day, and get things done so much quicker than before! Another example - before starting triathlons, some people might conceive training for it as just sticking to a routine, going through the motions and being disciplined. You have to force yourself to put up with the training. Nothing could be further from the truth. Once you get into it, you’ll look forward to the training sessions. Both for the enjoyment of the sport itself, but also for the social aspect involved if you partake in group rides, masters’ swim classes and so on. Finally, you’ll never know unless you give it a go! So start sooner rather than later, and if you find that you really don’t enjoy it, quit and do something else instead. But there’s no point procrastinating on the decision. Debunking the ten thousand dollar myth, or “Triathlon on a shoestring"
A common fear of beginner triathletes is that they need to invest a lot of money on gear, pool memberships, coaching etc. before even knowing if they will enjoy the sport. This is an unfortunate misconception. I’ll talk more about gear in an upcoming post in this series, but for now, rest assured that you don’t need to invest in a new expensive bike, a fancy wetsuit, or a whole lot of gadgets and gizmos. 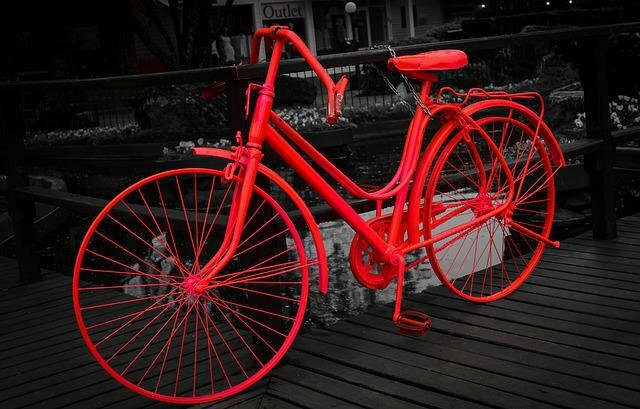 You will be fine with any old single-speed bike. The shopping basket in front will be great for holding a water bottle or two! Yes, you could do a triathlon on something like this. Of course, if you want to get a wetsuit and a road bike or tri-bike right away, that’s great! But plenty of people get started with just the bare minimum, and then invest in more and better gear when they realize that they love the sport and want to stay in it for the long haul. During the swim leg, there are safety boats and kayaks out there on the look-out for any potentially dangerous situations. If you get tired, you will be able to get on a boat. Rarely, if ever, will you be alone at any part of the course for longer than a few minutes or even seconds. There are volunteers, spectators and other participants around. If something happens, they will help you or call for assistance if needed. Is triathlon completely risk-free? No. In 2012, USA Triathlon released a report on deaths in triathlon from 2003 through 2011. The total number of deaths over this period (in USAT-sanctioned events) was 45. This means that the fatality rate was approximately 1 per 76 000 participants. Most deaths occurred during the swim leg, and were related to sudden cardiac arrest (SCA). On the bike, SCA or traumatic deaths (crashes) were the main causes and on the run SCA was the single cause responsible. The report stated that the deaths included athletes from a broad range of experience and ability level. Beginners with lower swim ability were not more likely to die than anybody else for example. To put this in perspective, researchers worked out that between 2004 and 2008, 1 in 44 000 died of SCA in sports in general in the US. This means that the fatality rate is considerably lower in triathlon than the average. In basketball, the sport with the highest rate of deaths, 1 in 11 000 died. Also, in a 2014 report by the SCA Foundation, the number of yearly out-of-hospital cardiac arrests in the US was 326 200, with an average survival rate of 10.6%. I’ll leave the math to you (the US population in 2014 was about 319 million), but let’s just say that the risk of SCA is no reason not to do triathlons. That said, there are a few points I want to make related to safety both during training and racing. Although triathlon is safe, and you’ll greatly increase you’re life expectancy by being active and healthy, minimizing risks is never a bad idea. Don’t practise open-water swimming alone. ​In traffic, whether riding or running, always follow the rules and be visible (use reflective gear and/or lights when needed). If you’re really sick, don’t train or race. You can do easy workouts even if you have a light cold though. Just stick to these principles and you’ll be fine! Pheww. We’re getting to the end of this post. There’s just one more point I’d like to make that I believe is important for beginner triathletes to realize. Triathlon is an amazing sport. I’ve mentioned several reasons why earlier in this post. But there comes a point when you realize that it’s not just a sport. That point may come soon after you start or, it may come further down to road. It might be a sudden aha-moment, or it could creep up on you gradually. But what most triathletes experience, is that triathlon at some point becomes a lifestyle as much as a sport you participate in. The habit of working out becomes so ingrained that you never think twice about it. Like brushing your teeth, it just happens automatically. One day you may realize that what you really desire to do more than anything else is to go with your best training buddies on a looong training ride in the mountains, because that's what will make you feel the most fulfilled and satisfied. Above all, it forms a mindset for your whole life where nothing is impossible, and you leave self-imposed limits behind. Hopefully this post helped you learn more about what triathlon is, what it means to be involved with it, and whether you should get involved too. As I said, this is the first post in a series of posts geared towards beginners and prospective beginners. In the next instalment we’ll talk more about how to actually get started. What are the prerequisites and what equipment do you need? I briefly touched on it here, but that post will cover it in detail. Finally, don’t forget to grab your Five step roadmap to completing your first Triathlon! This roadmap follows along nicely with this whole blog post series, so get it now and you can reference back to it in all coming posts as well!